Yesterday, Facebook friend Robert Schneck uploaded some photographs onto my Photogenic Fauna and Flora group page that greatly intrigued me. They portrayed a quartet of very spectacular animal statues – a black-painted griffin with gilded beak and fore-claws, a white ram (albeit one that, curiously, lacked horns), a crown-bearing white salmon (although sometimes referred to as a dolphin! 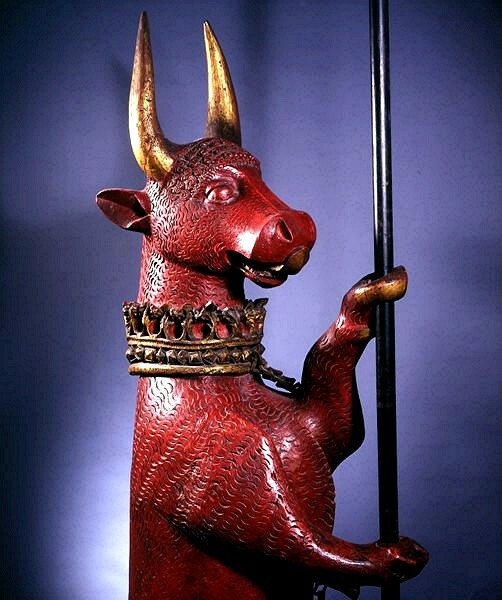 ), and a red bull with a gilded crown around its neck - each of which was wielding its own unique standard. He stated that these were known as the Dacre Beasts, but as no additional information was present, and as I had never heard of them before, my interest was seriously piqued. Following an intense Googling session, however, I finally uncovered their remarkable story. So here it is – for the first time on ShukerNature, the fascinating history of the Dacre Beasts. They derive their name from Thomas Dacre (1467-1525) - a brave soldier from Cumbria who, unfortunately, fought for the losing Yorkist King Richard III at the Battle of Bosworth in 1485 against the victorious Lancastrian Henry Tudor, who duly became King Henry VII, founder of the Tudor Dynasty. Happily, however, Dacre survived (unlike Richard III), became Lord Dacre, and sometime between 1507 and 1525 he commissioned the carving by local Cumbrian craftsmen of the statue quartet bearing his family's name. 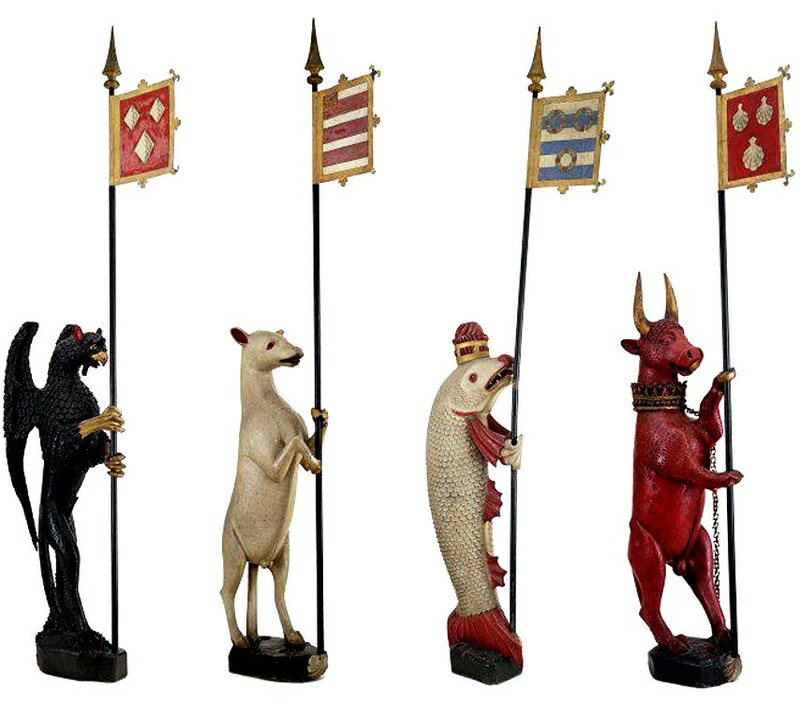 Unique examples of large-scale free-standing English Renaissance heraldic woodcarving, each Dacre statue stands 7 ft tall, and all of them were created from the trunk of the same oak tree on the estate of Naworth Castle at Brampton, near Carlisle, in Cumbria, which was the Dacre family home at that time. They were repainted shortly after a major fire at the castle in 1844, which, thankfully, they survived, and were restored in 1849 under the supervision of Victorian architect Anthony Salvin. Their standards and tinned copper banners were also added during the 1800s. But what do the Dacre Beasts represent? According to Ben Le Vay's engrossing book Eccentric London: A Practical Guide to a Curious City (2012), they all have links to the Dacre lineage. 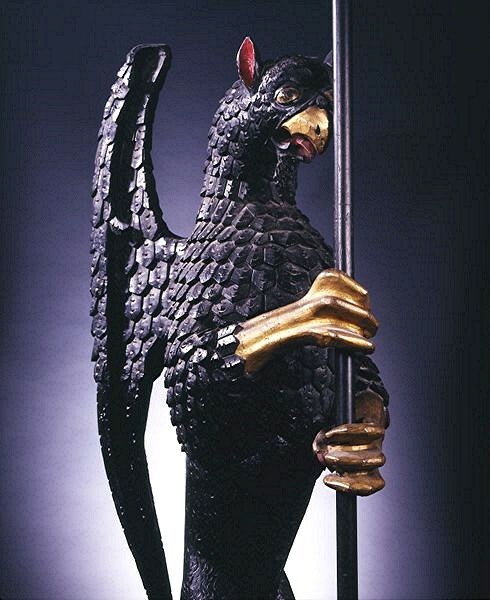 The griffin represents Lord Dacre's ancestor, Ranulph de Dacre, who in 1335 fortified Naworth Castle, and founded one of northern England's most powerful families during that period in English history; its banner bears the 19th-Century arms (three rose chaplets) of the Greystoke family (The New Greystoke Arms). Chaplets are bearings representing a garland of leaves with four flowers at equal distances, and they signify great military prowess. Interestingly, the Dacre griffin directly inspired Lewis Carroll's creation of the gryphon in his classic children's book Alice's Adventures in Wonderland. The hornless ram represents Ranulph de Dacre's wife – a member of the de Multon family (or Mouton - French for sheep, hence the ram); its arms are borne upon the banner, and include a lion passant gardant with three bars gules (red) upon argent (silver). The salmon (or dolphin?) represents Lord Dacre's wife, Elizabeth de Greystoke (1477-1516), with whom he eloped in 1488 when a young man; the banner displays her arms, which are three cushions of argent. 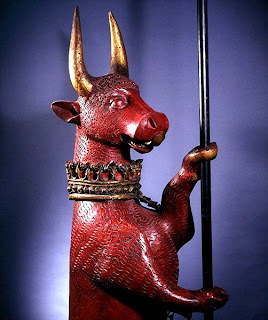 The red bull, with gilded horns, tongue, hooves, and the crown around its neck, was the emblem of the Dacre family; and its banner bears their arms – three white scallops on a red field. So where are the Dacre Beasts today? For over 400 years, they remained ensconced in stately seclusion within the Great Hall of Naworth Castle. In 1999, however, they were donated to the British Government in lieu of inheritance tax by the castle's then owner, Philip Howard (whose family gained it when Sir William Howard married Elizabeth Dacre in 1577). 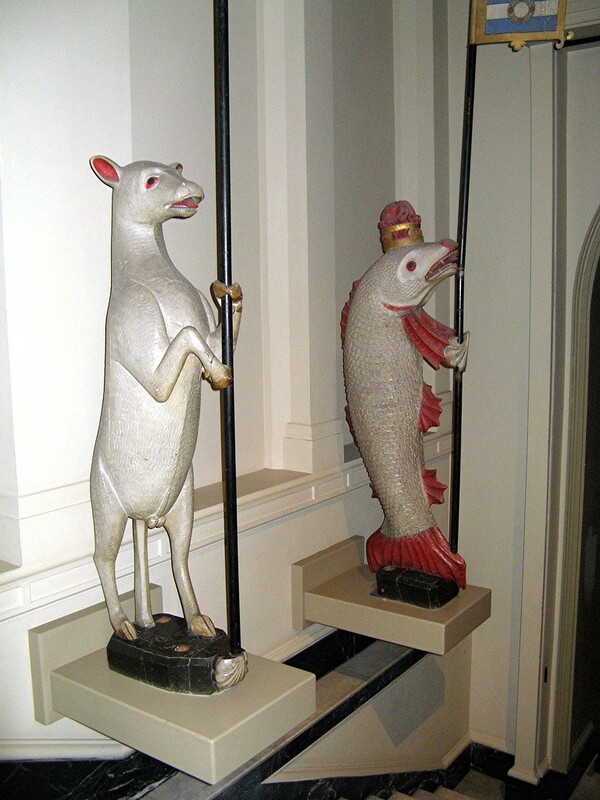 Since then, they have been held and displayed at the Victoria & Albert Museum in London. 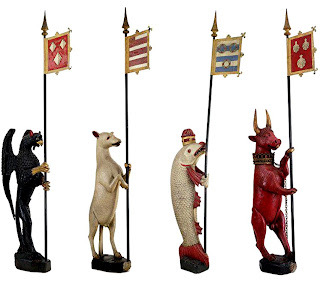 So here is you should visit if you wish to see for yourself four of the most magnificent animal statues from the annals of English history and heraldry. Interesting, have these any connection to the Dacre Bears? Are they representations of the same creatures? No, the Dacre Bears, in the churchyard of the Cumbrian village of Dacre, are much older, possibly even pre-Saxon, and as one is apparently maned they may not even be bears at all, but rather lions. They certainly are not a griffin, ram, salmon, and bull. While on the subject of griffin, although it might be a mix between an eagle and a lion, both symbols of Power and Bravery, there is an odd depiction of it in Georges Eberhart's book which oddly reminds me of a Chalicothere ! Interesting article - revisited the Dacre 'bears' yesterday. The style of carving does not seem to fit with a pre-Saxon origin.